Working class Pennsylvania was the place to be, and the children knew it. At least they pretended they did for Mark Cohen’s photographs, at Danziger through June 20. A boy holds a cat confidently in one hand, its tail on his bare shoulder and its wide eyes very much in your face. Another bounces a ball too big and too good to be true, and girls hang happily upside down. Cohen lingers over bare legs, spread confidently below shorts, swimsuits, or skirts. He is not projecting his lust onto the underage, but rather watching them as they discover a less-innocent world. For all their pleasures, the inhabitants are still tangled up in decrepit housing, unpaved streets, and their own desires. The tangles extend from twisted cables in an empty yard or strands of a wire fence left for trash to a jump rope halfway between a girl’s legs. They are implicit in the unspoken record of a scrap of paper on mangy earth. They include the gorgeous strands of a young woman’s hair, but also the narrative tangle of her face buried in her hands and a man’s arm reaching out to touch her. Has she recoiled from the threat of violence or failed to register his support? Does either of them know? Cohen had a solo show at MoMA in 1973, and he worked increasingly in color, at a time when art photography was not altogether accepting. The change took him more toward group shots, in search of tensions within entire families. Still, his color compositions are flat compared to the wildness of black and white. That bare-chested boy has the smile and sunlit hair of an androgynous god, with the black cat a Madonna’s demonic child. Photos like this one update René Magritte and film noir for blue collar America and a decade of turmoil. From the look of things, they did not have far to go. In 1976, Barbara Crane set out to take another city’s portrait, one building at a time. 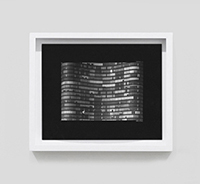 True, she could not invite downtown Chicago into her studio, although Zoe Leonard comes as close as one can to bringing the Upper East Side into the 2014 Whitney Biennial, with the museum architecture itself as her camera obscura. Crane could, though, take the care and equipment of studio photography outside, where for three years she took more than five hundred 5 x 7 negatives. Where once a Leica had transformed street photography into a record of the human pulse of a city, she took the reverse route, willing to accept accident but to abolish anecdote. Shadows, edges, and planes have a place in all their variety, but little more. This is not about functional habitation or a preservationist’s carved detail, but rather the structure and rhythms of disorder. Crane brought the same plainness and care to the entire process, with one contact print to an 8 x 10 gelatin silver sheet, its broad edges blackened in the process. The camera’s film holder adds an additional slim border, which she did nothing to efface. Then she made her selections, first to ninety, then to forty for a book, and now for the first New York solo exhibition of Chicago Loop, at Higher Pictures through June 21. Much like art, a city then was in transition between Modernism and its aftermath. One can see the grid of windows and of formalism, the textures of stone and glass, diversity and decay. Landmarks and orientation are hard to come by, but one knows where one is all the same. Born in 1928, Crane studied with Aaron Siskind at Chicago’s Institute of Design, founded at the Illinois Institute of Technology as the “new Bauhaus.” Like the Bauhaus, she can appreciate design and architecture as a vocabulary for living subject to repetition and to change. And like Siskind, she has used close-ups to approach abstraction, with objects at rest and people close to a frenzy. She has photographed a single stick, a single mushroom, a single child, and hands and waists cut off as in a dance. For the Loop, a façade can line up parallel to the picture plane, but even angles and corners in close-up define a shallow depth. With her head under the black cloth of a large-format camera, one can almost imagine her reminding a building to face the camera and to smile.